Please note that we now ship only full-size DVDs with our Zentangle Kits. For more information on that change, see this blog entry. 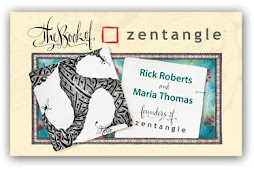 This blog can be a great knowledge base for Zentangle. Today, we'll discuss Zentangle's DVD. We chose a small format DVD - about three inches diameter because it fits nicely in our kit. This small DVD will play in any tray loading DVD player found in many desktop computers and home entertainment players. Notice that inner circle in this next picture. It's made to receive small DVDs. Our small DVD also plays nicely on spindle drives that are found on many laptops. 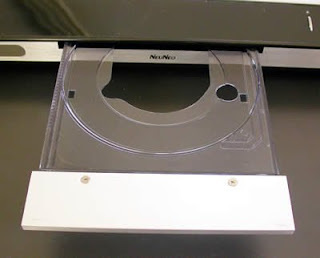 You open your disc player and push your disc onto a post similar to this next picture. 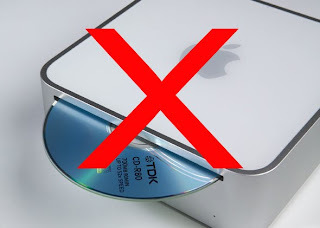 However, most Apple computers use a slot-loading system that pulls in the disc and then ejects it through a narrow slot as in this image below. Our disc is too small to be ejected. If you have this type of DVD drive, just let us know when you order your kit and we'll send a large DVD instead. Occasionally we get emails about not hearing sound (which is Rick playing Native American style flutes he used to make - another story for another time) or not being able to play the DVD at all. Most instances seem to have been related to certain versions of Windows Media software not understanding the "codecs" (whatever they are) of our DVD. We now have them made for us and we have been assured that our DVD coding is up-to-date. 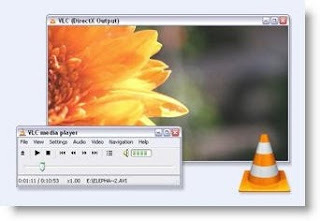 One solution that has fixed this issue every time is VLC Media Player. It's a free, open-source, high reviewed multi-media player. If this doesn't work, we'll exchange your DVD, no questions asked. If you have have any questions, comments, insights - jump in! I love the Zentangle dvd... it's so small but plays big... almost 1/2 hour of pure meditative bliss... awesome demonstration by Maria... I just love watching it over and over... I never get tired of it. :) Great job... would love to see more! I too, love the DVD and would really love to see more. Maybe even just some short video clips on your blog showing how to do tangles. i appreciate all the information that is available on your website and now in your blog. I am enjoying learning all that I can about Zentangling and I am hungry for knowledge. I refer to your website, this blog and Sandy Bartholomew's blog (Beez in the Belfry) on a daily basis. Thank you for launching this blog!